Cut the cord (sort of). The Oculus Rift and HTC Vive have ushered in an emerging era of VR gaming, though both solutions require that you tether the headset to a relatively powerful PC. MSI's new VR One backpack cuts that cord, or at least redirects it to a PC that you wear on your back. The VR One is being pitched as the world's first-ever VR backback. It's a concept that MSI has been working on throughout the year and is now showing off at the Tokyo Game Show. Wearing a laptop on your back doesn't sound all that appealing when you'll already be dancing around immersed in VR, though the VR One weighs just 3.6kg, which MSI says qualifies as the lightest (and thinnest) backpack PC system on the planet. MSI isn't giving a detailed accounting of the specs just yet, instead just saying it comes with an overclocked CPU and GTX 10-series graphics card. It also comes with a pair of battery packs that can keep you in the game for up to 1.5 hours (LEDs indicate how much battery life remains). In short, it's a standalone PC that you wear like a backpack to avoid tethering your Rift or Vive to a desktop system. That means no worries of tripping over cables, though woe betide you if you manage to tumble to the ground or trust fall into a wall while bouncing around your VR gaming space. 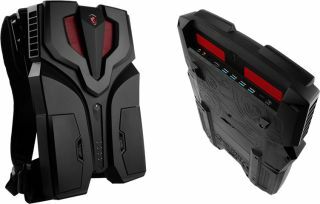 As for the VR One's looks, MSI says it ran with a "futuristic robot machine style." It's going to draw inevitable comparisons to a proton pack from Ghostbusters, especially now that a remade version of the classic movie is introducing Ghostbusters to a whole new generation. Finally, let's talk cooling. The VR One sports dual 9cm fans and nine heatpipes. According to MSI, noise is kept 'near-silent' at under 41 dBA, allowing you to game into the wee hours of the night "without waking up your pets and parents." And hopefully you're light on your feet. MSI says the VR One is optimized for the VIve. That's not surprising, since the Vive uses a pair of wireless lighthouses instead of a connected (and stationary) sensor. The VR One has a single HDMI port, one mini DisplayPort, a Thunderbolt 3 Type-C port, and four USB 3.0 ports. MSI didn't say how much it plans to charge for the VR One and whether or not there will be different configurations. It also isn't ready to discuss a release date.